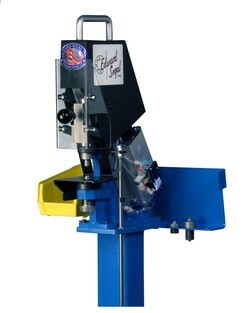 The Model 3P6 is a portable pneumatic press specifically designed for grommet applications. 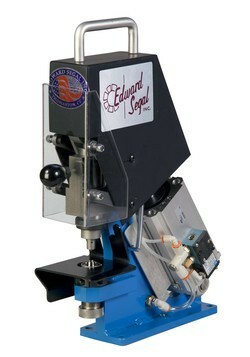 At only 22 pounds, 17" tall, 4" wide, and 11" deep, this powerful compact press is capable of punching a hole in a wide range of industrial fabrics and setting a grommet and washer, all in a single cycle. The 3P6 is available for grommets up to a No. 4, Plain (Sheet Metal) and Rolled Rim, and can also accomodate some eyelets and snap fasteners. The setting tools in the 3P6 are interchangeable and simply threaded in-place to facilitate fast conversion between grommet sizes. 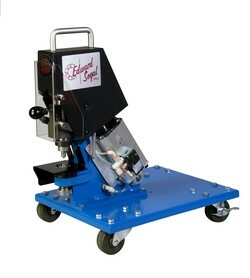 This machine is built on a sturdy welded frame and designed for safe operation, portability and ease of use. The 3P6 is designed to be portable or bench mounted. Several alternative configurations allow the 3P6 to be used in the most productive manner including: (a) Pedestal Stand with optional foot pedal; (b) Tool Rack with Storage Bins; and (c) Mobile Base for floor work. The 3P6 provides a number of benefits over the hammer or manual press methods, most notably putting an end to the ergonomic challenges. It also reduces the grommet cost for users of Self Piercing Grommets. The 3P6 punches the hole rather than the grommet cutting the hole, so the additional cost for Self Piercing Grommets is eliminated. When extra force is needed for oversized grommets or heavier material, the 3P6-X should be considered. · Bench: 17" x "4" x 11"
· On Stand: 39" x 18" x 19"